Periodically we want to test lenses, and the question always comes up: what to use for a target? In a recent round of testing, I spent an embarrassing lot of time shooting a moth wing, only to realize after I had done several lenses that the wing really wasn't working very well. I know, you'd think I would have noticed sooner, but hey, moth wings had worked well before. After much thinking and several experiments that mostly revealed more problems, here's what I came up with (shown with one of the lenses tested -- an MP-E 65). 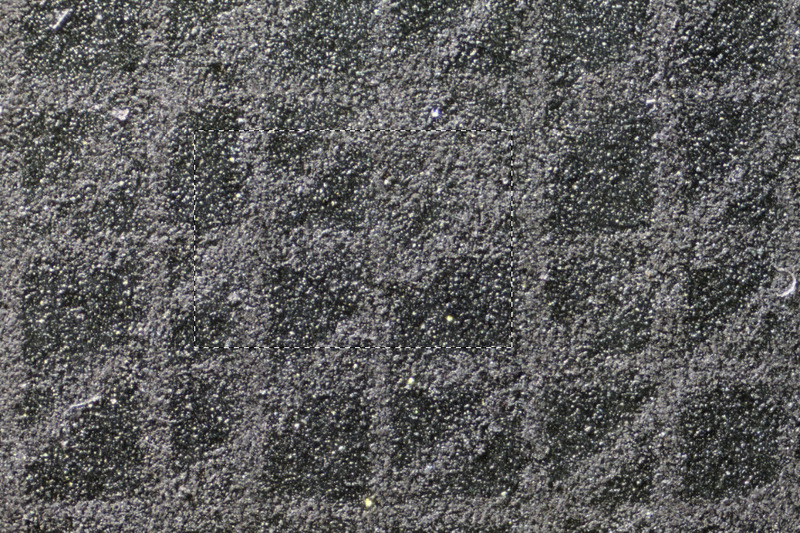 The target is a piece of 600-grit silicon carbide sandpaper, taped to a microscope slide, and scored on a fine and not terribly regular grid using a spring steel insect pin which had been worn to a chisel point in earlier experiments along the same lines. Let's work our way in and see what this thing looks like. The full 40X image, with a marquee showing a crop to be enlarged. 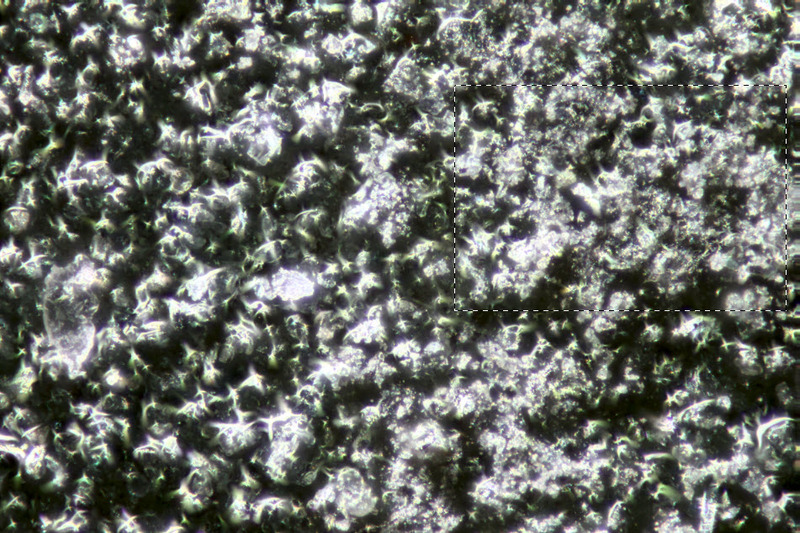 The lower left portion of this frame is an unscored area, consisting of 600-grit uncrushed particles sitting in what must be a layer of glue. I'm pretty pleased with how well this target worked out. The scoring process does two things: 1) it creates a recognizable pattern that is easy to line up after changing lens setups, and 2) it crushes a lot of the silicon carbide particles, producing a huge amount of detail at all size scales down to smaller than my lenses will resolve. In addition, the target is generally flat but still has enough depth to reveal color aberrations, and it should hold up well in storage for subsequent tests, at least as long as I can avoid touching the surface. I was interested to see what appeared as I zoomed in closer and closer. 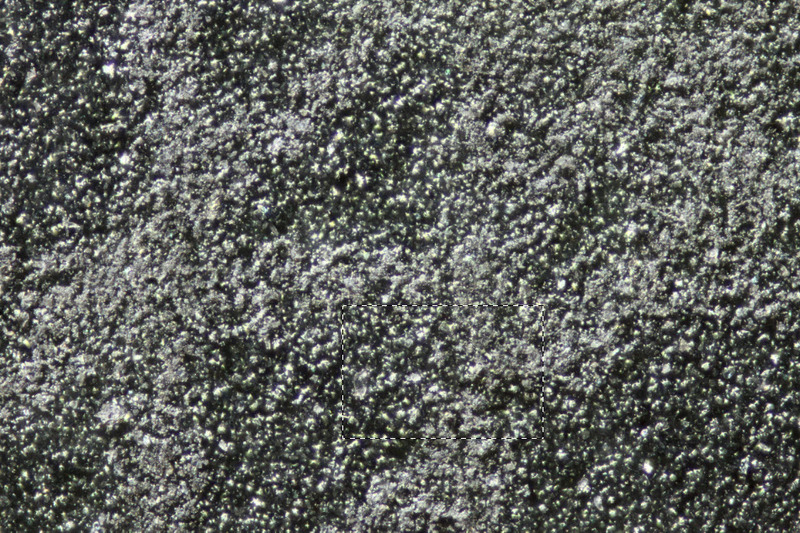 At low magnifications, the sandpaper is mottled gray. But at higher magnifications, its true nature is revealed as a bunch of shiny dark crystals. Light versus dark gray is a matter of how many crystal surfaces are oriented to reflect the light to wherever your eye happens to be. The score lines are brighter than undisturbed surface under most conditions, but when illuminated and viewed from certain angles, they can be almost invisible or even darker than the undisturbed surface. So, the target really consists of a random collection of bright specular reflections floating in a sea of darkness. This combination is merciless about revealing chromatic aberration. Here for your amusement are several views of the same chunk of target, as seen by various lenses at 4-5X and 100% pixels. These are individual frames, not stacks. Typically stacked results have much less false color than individual frames since most of the OOF information has been thrown away. One last comment about color aberrations. 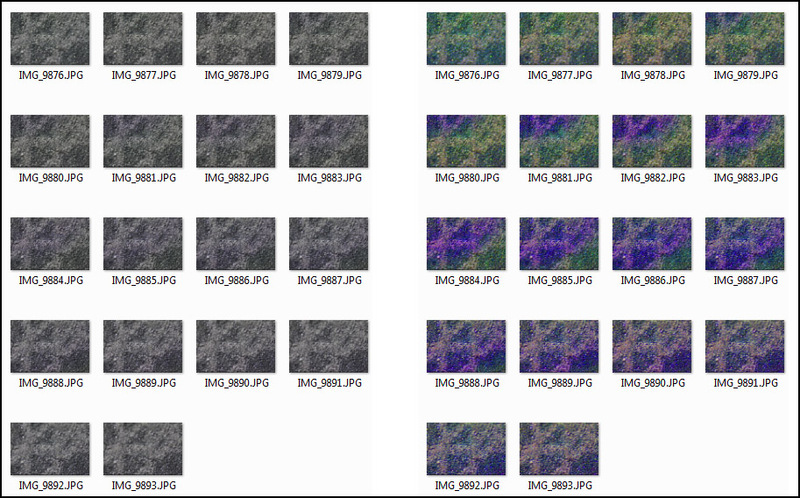 If you look carefully at the 4X frame, you may notice that has a slight hue in certain areas. That's caused by longitudinal color aberration combined with a nonlinear transfer function between amount of light and pixel values. Essentially, light that gets spread into dark areas "counts more" than light that stays nicely focused into bright areas. As a result, the color balance shifts from neutral for very OOF regions, to reddish just on one side of focus, neutral again at focus, to greenish on the other side of focus, and back to neutral again for very OOF. This pattern is particularly easy to see in a thumbnail rendition of a stack shot with a slightly tipped target so that focus and the aberrations slide across the frame in a predictable manner. Here's one I shot with the Olympus 38 mm. I've cranked up the saturation on the right so you can't miss it. The Olympus 38 crop in the previous panel comes from IMG_0083, a small area at image center where focus is perfect and the color shift is passing from reddish to greenish. I hope this is helpful, or at least interesting. Looks like a new standard test subject. Is the sand paper you are using of a special brand? It could be internationally available, perhaps. Surely you're joking, Mr. Littlefield! As I can't remember having ever seen you posting anything that was not helpful, interesting or inspiring. Much appreciated and enjoyed as always! Is the sand paper you are using of a special brand? It came from my local hardware store. Ace brand. I have no idea if other brands would behave differently. Good points, and no, I definitely do not know for sure. I was just reacting to the appearance. Certainly there will be some steel particles, because the end of the pin is obviously reshaped. That Olympus lens is not too shabby. That's the Olympus 38 mm f/2.8 bellows macro lens, HERE. High quality, but price to match and hard to find. They were cheaper and easier to get several years ago, when I got mine. I have been testing lenses myself, sand paper seems like a good option ( I have used butterfly scales. Rik, thanks and congratulations for your tests. This is a lot of good and significative work. Could you repeat the turnbail test of longitudinal chromatic aberration with your images from the Nikon 10X 0.25 CFI?. I do find it as much interesting as the resolution test itself. Usually the LCA is magenta/green like in the Oly 38mm or red/cyan but in this objective seems to be blue/yellow, but the blue halos may be due to another kind of issue. . . .caused by longitudinal color aberration combined with a nonlinear transfer function between amount of light and pixel values. . .
And for your next feat, Rik, how about reconciling general relativity and quantum mechanics in 18 words or less? This bugaboo has been driving me nuts for some time. I'd gotten the fact that it was LCA I was seeing, but didn't tumble to the nonlinear transfer function part, which is critical. I've had situations where the aberrant color makes useful observation impossible, and where it moves around like a ghost depending on how I light. It really threw me that by reducing the contrast of the lighting, I could often reduce the aberration much more than could be explained by having simply masked it with other light. But throw in the bit about the pixel values not being a linear representation of light, and it all makes sense. Ahhhhh. Questions about this have been raised, in one form or another, several times at PMN. I've never before seen a useful answer. Again, thanks for the work you've put into this! Sure. This is for the Nikon CFI at 10X. The target was oriented a little differently for this test, so the pattern sweeps in the other direction. As before, screen version on the left and ultra-saturated version on the right. I got to using the color as an indication of where to start/stop shooting my stacks. 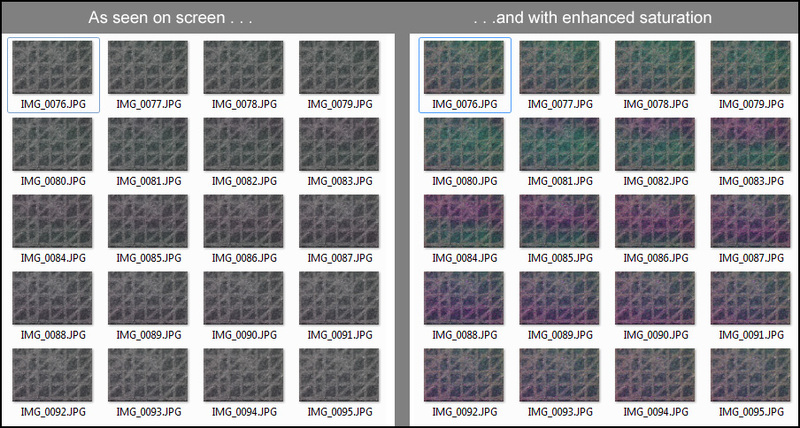 No need to mess around with zoomed-in Live View, just watch for color to appear and disappear in the full-frame view. This confirms the particular LCA of this lens. Great thread - I'm a big fan of having a reproducible, flat test object to evaluate one's rig, etc. Would a diamond dust or some other crystalline dust sandpaper or dust-coated object work better? I guess it would depend heavily on how sharp the edges of the crystalline fragments are as well as their size and perhaps color. Just wondering if there are any other readily available, affordable options that might be a little better in some way. Rik's design and materials of course looks very promising and may well be good enough for most if not all purposes. 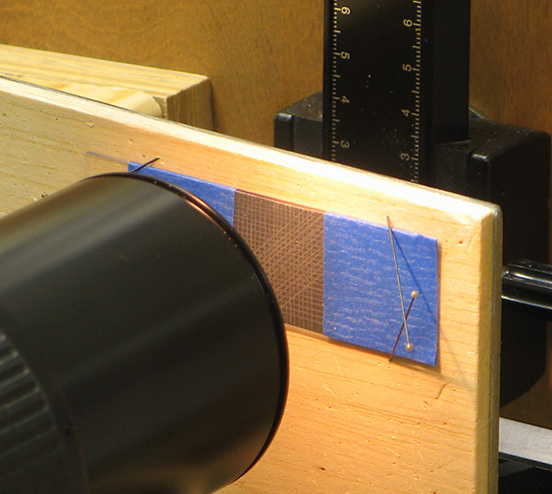 See NikonUser's modification -- loose carborundum power distributed on sticky paper. Very cool! I got curious about the issue that Betty raised, so I took another look to see if I could tell exactly what's going on in the score line. Here are a couple of images shot at 50X, oblique to the paper so that we can get a better feel for the 3D structure. Each image has unscored paper on each side, with a score line down the middle. The first image also has a little chunk of brown stuff that has nothing to do with the score line. It turned up by accident when I framed the line, and I thought it was visually more appealing than the paper alone. The overall impression I get from these, especially the second one, reminds me ever so much of glacier wear marks on hard rock. Those result from the glacier breaking off chunks of the rock and sliding them over the bulk mass, producing linear scratches mixed in with a bunch of fine rubble. Of course by the time you can see them, the ice has melted away! 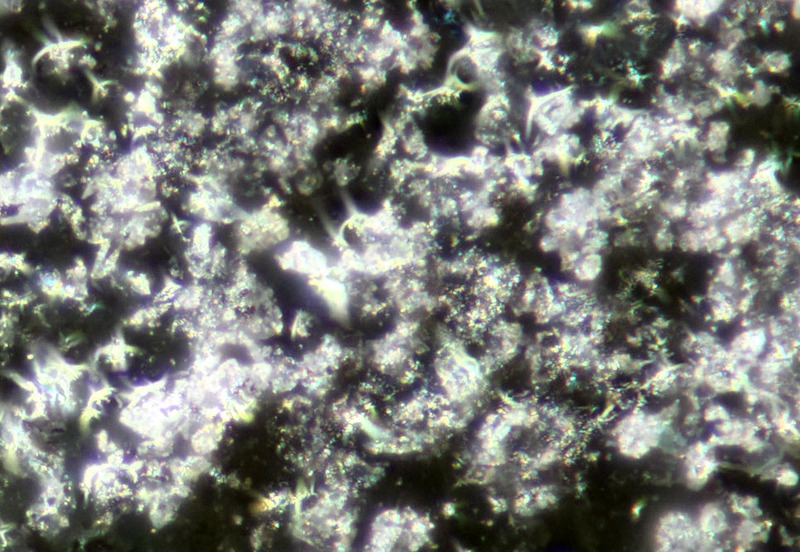 In this case, I suspect we're seeing a lot of iron dust, mixed in with some silicon carbide dust from broken off chunks of abrasive crystal being dragged along. But of course I don't know for sure. I suppose a properly equipped SEM could figure it out, but I don't have one of those. I ran a quick calculation of the forces and sizes involved here. It turns out that the average pressure over the entire contact area of the now chisel-shaped end of the pin is around 500 psi during the scoring process (70 gm, 0.43 mm diameter). Pressures at the actual contact points would be a lot higher than that, but I have no idea how high. Having looked at these pictures, I'm liking the loose powder better and better. 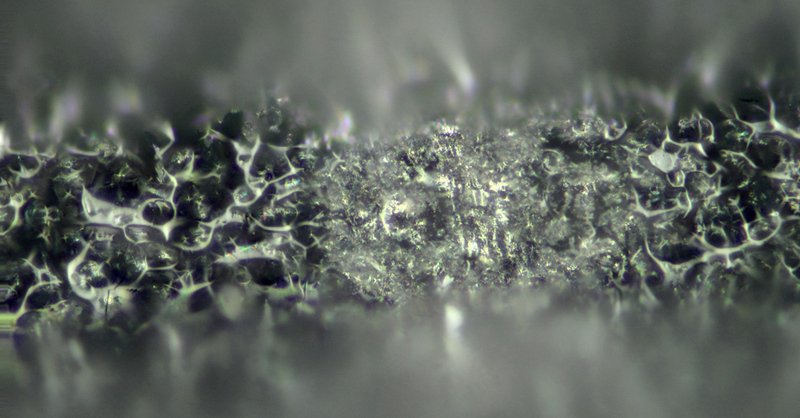 Optics: Nikon 50X NA 0.55 inf/0 ELWD objective, focus step 2 microns by StackShot rail. Camera: Canon T1i, sensor 22.3 mm wide.